I got an email the other day from a guy. He came across my video on YouTube about the Hemophilia ride. One of the dangers, especially in the past, of hemophilia, are the dangers that could come about as a result of blood transfusions. 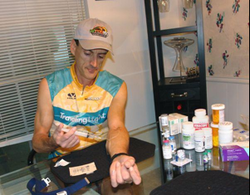 Because of a blood transfusion, Barry has also had HIV and Hep C since he was 13 years old. I just happened to catch your video on Youtube re: the ride. Thanks a lot for what you’re doing. I was wondering how many participate in the ride? I’d sure love to ride in it. I am a 43 year old severe hemophiliac. I’m also a 30+ year survivor of HIV and Hepatitis C, from which I now have liver cirrhosis. Medical problems notwithstanding, I have been an avid cyclist for more than 10 years now. I thought you might be interested in this article that ran in my local newspaper in The Woodlands Texas (near Houston). Perhaps you could share it with Zach’s family and the hemo chapter out there. Good luck on the ride-that’s some beautiful country you’re riding through. I’ve seen it by car, but not on the bike. Maybe I can come out there some day and ride in the event. Maybe they’d give me a discount on the entry fee for BEING a hemophiliac!! Check out the article about Barry riding in Texas. Thank you Barry for the email and the inspiration. And thank you to all of you who have continued to partner with me in this ride and given toward helping folks like Barry and kids like Zack. Click here to partner with me in the California Coastal Race for Hemophilia. And just to update y’all, I’m 66% of the way there! Only 2 1/2 months to go!